Indianapolis' new library addition has been a long time coming, with years of delays and millions of dollars in cost overruns. (I mentioned it briefly in an article I wrote last month about construction delays). It's beautiful on the outside, dramatic inside in places where theatrics don't sabotage its practical mission, and more than adequately respectful of the 1917 Paul Cret building that it kisses on the backside. But the best part of the architecture story here isn't about space or form or style. It's about how the new Evans Woollen-designed wing symbolically engages the outside world instead of forming a refuge from it. It's a renovation of the role of the public library, an outfitting for a future in which paper-and-ink books and periodicals may seem as quaintly irrelevant as the typewriter and card catalog embalmed in transparent time capsules in the new building's floor. Big library projects such as this one raise a question, though: What exactly is the role of a library these days? What should its places in the community be, when everything it offers can be obtained more easily (although not necessarily for free) online? 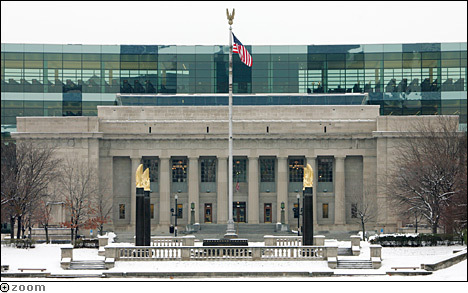 The Indianapolis Star takes a look at the relevance of libraries in the Digital Age.